If you aren't color blind, you will be able to see the answer to the question about life, the universe and everything (according to "The Hitchhiker's Guide to the Galaxy") This is an accurate reproduction of an Ishihara color test for red/green color blindness.This pattern was hand designed by a pr.. The headmaster of Hogwarts is peeking up at the bottom of this image which also contains some trivia about him. The facts are in a font familiar to fans of Harry Potter and in the house colors of Gryffindor.This pattern was hand designed by a professional artist/crafts personFinished size is approx.. 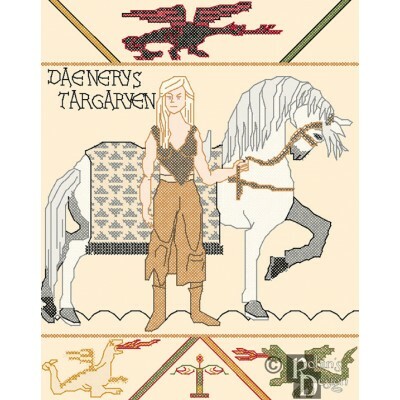 The Game of Thrones expressed in the style of the famous Bayeux tapestry. The lettering style is drawn directly from the original embroidery, as are other elements, but the characters are inspired by the books. I recommend using ivory aida to give it an aged look.This pattern was hand designed by ..
Show everyone what a hoopy frood you are with this reminder from The Hitchhiker's Guide to the Galaxy. The pattern can be stitched on colored fabric or the background can be sewn. Please specify if you want the pattern with or without the background stitches when ordering.This pattern was hand desi..
Harry, Ron and Hermione's least favorite student at Hogwarts is peeking up at the bottom of this image which also contains some trivia about him. 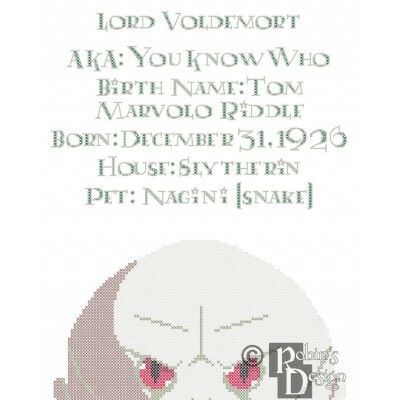 The facts are in a font familiar to fans of Harry Potter and in the house colors of Slytherin.This pattern was hand designed by a professional artist/cra.. The boy wizard is peeking up at the bottom of this image which also contains some trivia about him. The facts are in a font familiar to fans of Harry Potter and in the house colors of Gryffindor.This pattern was hand designed by a professional artist/crafts personFinished size is approximately 8" w.. The young witch with all the knowledge is peeking up at the bottom of this image which also contains some trivia about her. The facts are in a font familiar to fans of Harry Potter and in the house colors of Gryffindor.This pattern was hand designed by a professional artist/crafts personFinished si.. 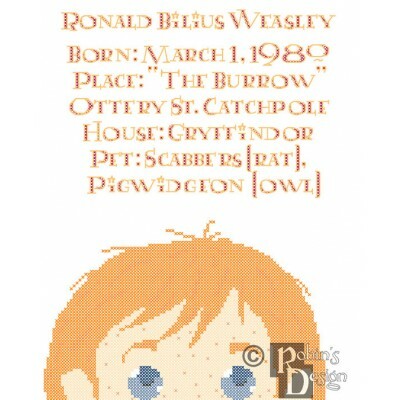 He Who Must Not Be Named is peeking up at the bottom of this image which also contains some trivia about him. 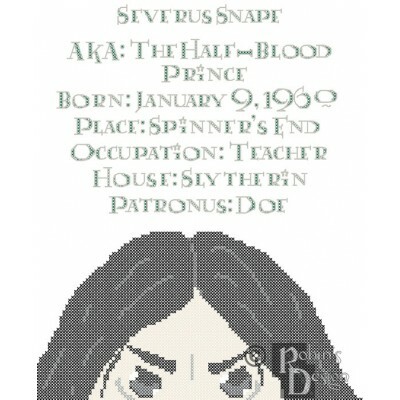 The facts are in a font familiar to fans of Harry Potter and in the house colors of Slytherin.This pattern was hand designed by a professional artist/crafts personFinished size is approxima..
Harry's best mate is peeking up at the bottom of this image which also contains some trivia about him. The facts are in a font familiar to fans of Harry Potter and in the house colors of Gryffindor.This pattern was hand designed by a professional artist/crafts personFinished size is approximately 8.. The most hated (or is it loved to be hated) professor at Hogwarts is peeking up at the bottom of this image which also contains some trivia about him. The facts are in a font familiar to fans of Harry Potter and in the house colors of Slytherin.This pattern was hand designed by a professional artis..
An iconic image from the great movie Gone With the Wind. 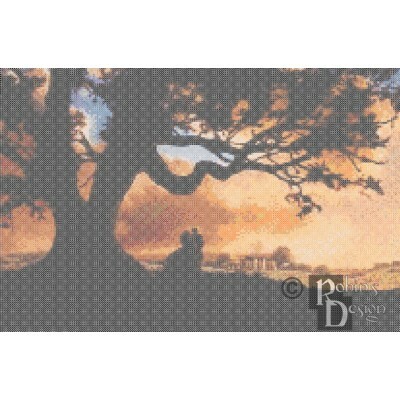 Tara at sunset with Scarlett and her father taking in the view.This pattern was hand designed by a professional artist/crafts personFinished size is approximately 15" wide x 10" high when worked on 14 count fabric (207 x 137 stitches) The ima.. The symbol that makes all wizards tremble when they see it in the sky, the Dark Mark. You-know-who liked his logo so much, he even used it as a paging system. 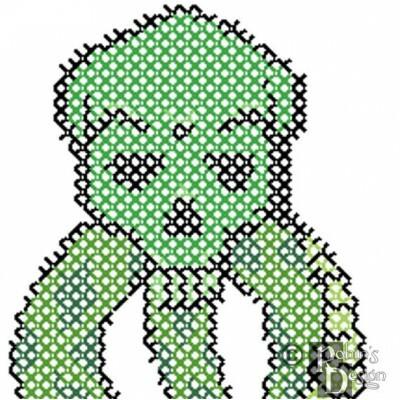 Depicted here in acidic greens, this pattern is ready for you to stitch your own mark.This pattern was hand designed by a professional artist.. The symbol that makes all wizards tremble when they see it in the sky, the Dark Mark. You-know-who liked his logo so much, he even used it as a paging system. 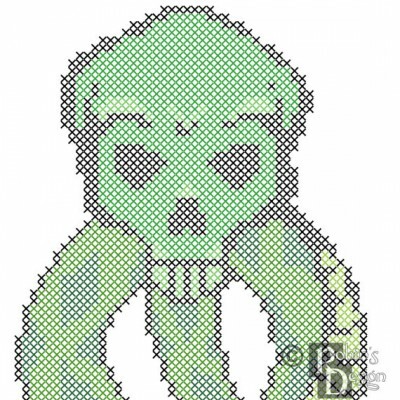 Depicted here in acidic greens, this pattern is ready for you to stitch the mark on shirts using waste canvas or aida.This pattern was hand des..
Just like in the Harry Potter movies and book. 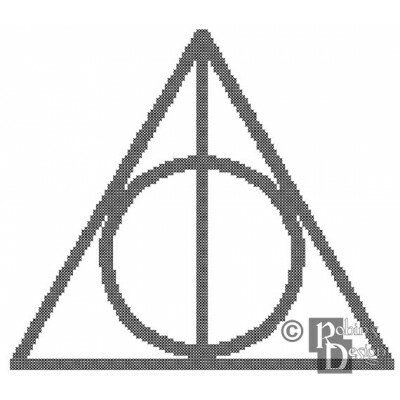 You too can show that you are a believer in the hallows.This pattern was hand designed by a professional artist/crafts personFinished size is approximately 10" wide x 9" high when worked on 14 count fabric (140 x 125 stitches) The image is composed of ..